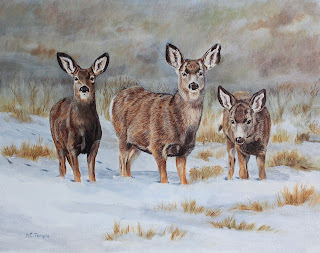 While pondering what subjects I'm going to paint for my upcoming show I came across some photos of young mule deer that I had taken some time ago. It was late autumn in the photos, but the yearlings were already decked out for winter with their woolly ears and coats. Not sure if I was friend or foe they stared at me curiously. 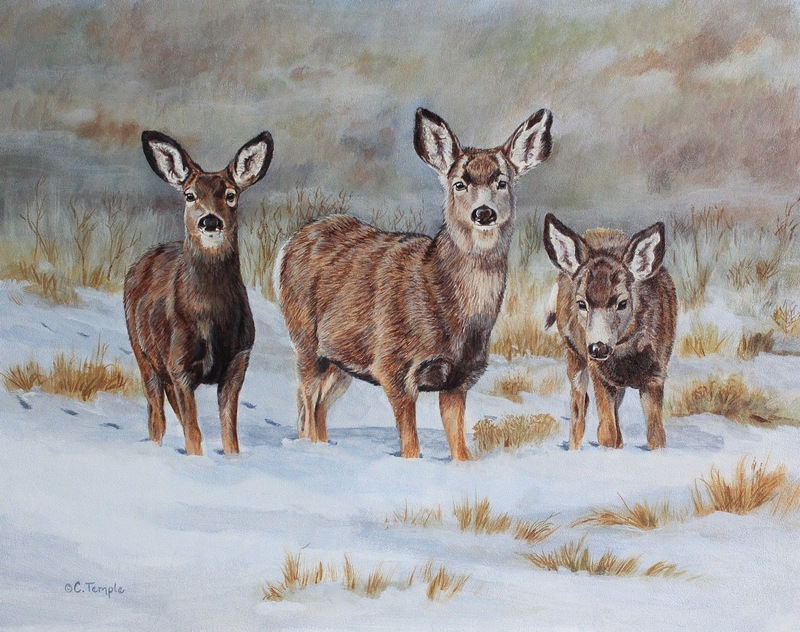 I enjoyed our encounter and thought it might be fun to paint them in a scene that better matched the thick coats they wore as they learned to survive in snow covered canyons. I chose some poses and made cut-outs to play with composition and placement of the deer. When I was satisfied I made my sketch. I was only lacking one thing....a good background. I had not paid much attention to background or habitat when I took the photos, concentrating on the deer instead. I attempted to just "wing it" on the background, but that quickly took a bad turn and I almost ditched the whole concept. Finally, I decided to just paint the deer first and hoped the background would somehow just "speak" to me. Thankfully, it did. "The Yearlings" is available through my Daily Paintworks gallery.